Kadir, our senior partner, founded Kadir Kassim & Co. in 1976, the predecessor of Kadir, Tan & Ramli, which then became Kadir, Andri & Partners in 2000. Prior to that, he served in the Malaysian Administrative and Diplomatic Service and the Judicial and Legal Service between 1966 and 1973, holding positions as Foreign Affairs Officer; Federal Counsel and Deputy Public Prosecutor, Johore; Senior Assistant Registrar, Penang High Court; President of the Sessions Court, Kuala Lumpur; and Senior Assistant Parliamentary Draftsman, Attorney-General’s Chambers. 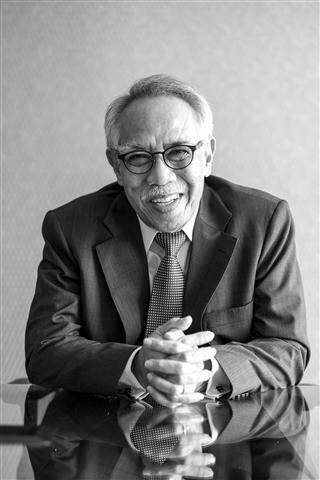 As senior partner of our Firm and with more than 46 years of experience in the law, Kadir is a doyen of the legal practice in Malaysia and is consistently recognised within the industry as being at the forefront of legal practice. Kadir has covered most aspects of legal work and practice, including litigation (both as counsel and on the bench), drafting of legal documents and banking and corporate matters, and has advised extensively on major corporate transactions. Apart from practising law, Kadir found time to serve as a member of the Malaysian Securities Commission from its inception in February 1993 until February 1998. He also served as a committee member of the then Kuala Lumpur Stock Exchange (now known as Bursa Malaysia Securities Berhad) from March 1998 to April 2004 and remained as a member of the Listing Committee of Bursa Malaysia Securities Berhad until April 2008. He was a director of Danamodal Nasional Berhad, a special purpose company established by Bank Negara Malaysia to facilitate the recapitalisation of financial institutions following the Asian financial crisis in 1997. He chaired the Islamic Capital Market Working Group of the Securities Commission. He now serves on the Corporate Debt Restructuring Committee and is a member of the Tabung Haji Investment Panel and of Financial Services Professional Board. Kadir was called upon to serve on the Boards of Government linked companies, both listed and unlisted, including Petronas. He is currently chairman of TIME dotcom Berhad and sits on the Boards of non-listed UEM Group of Companies. Kadir is also a director of Danajamin Nasional Berhad, the financial guarantee insurer jointly owned by Minister of Finance Incorporated and Credit Guarantee Corporation Malaysia Berhad, a financial institution majority owned by Bank Negara Malaysia which was established to be a catalyst and to stimulate and further develop the Malaysian bond/sukuk market. the first project financing syndication for Projek Lebuhraya Usahasama Berhad (“PLUS”). the first ever Sukuk issuance in the world. EPF’s take-over of Rashid Hussain Berhad (“RHB”) and RHB Capital Berhad. – the first time in which Bank Negara Malaysia approved more than one (1) suitor for a banking group. the landmark acquisition of Southern Bank Berhad by Bumiputera-Commerce Holdings Berhad. the merger of three large diversified groups with eight (8) listed entities emerging as the enlarged Sime Darby Group - the most complex corporate acquisition in Malaysia’s corporate history and multiple award winning transaction. the Astro Malaysia Holdings Berhad IPO.